You are currently browsing the category archive for the ‘Inadequate Sanitation’ category. – Over 220 at cheerleading competition fall ill with norovirus. – The outbreak likely started when a participant showed up at the competition while ill.
– Health officials believe that the outbreak grew because affected individuals vomited in public. – Chlorine bleach can inactivate norovirus; Quaternary ammonia (quats) are not recommended because the aren’t effective. – A 5,000 ppm (25 tablespoons 5.25% bleach per gallon of water). bleach solution should be applied to soiled areas for at least 4 minutes. 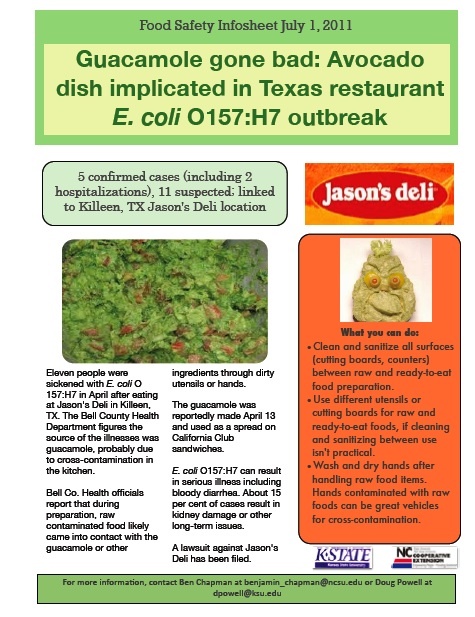 – The Bell County Health Department figures the source of the illnesses was guacamole, probably due to cross-contamination in the kitchen. – Clean and sanitize all surfaces (cutting boards, counters) between raw and ready-to-eat food preparation. – A Princess Cruises ship, the Grand Princess, has recently been linked to a second consecutive outbreak of Norovirus affecting 57 of the 2,468 passengers on-board. – To control the spread of Norovirus, use the proper tools when cleaning up vomit. -Tools include disposable latex gloves, a filter mask, and apron. – Pathogens can be aerosolized in vomit and be spread outside visually affected areas. – Practice good hygiene, especially food handlers who also care for children (including handwashing after handling diapers). – In 2006, Britney Spears was spotted changing her baby atop a restaurant table in Los Angeles. – Norovirus, Shigella, and Salmonella can be passed through poop to food and cause illnesses. -Poor sanitation or cross-contamination may have led to the closure. -Listeria monocytogenes can be deadly for the elderly. -In 2008, 43 individuals became ill and 22 died during an outbreak from Listeria-contaminated deli meats in Canada. The average age of victims was 77. -Clean and sanitize utensils and work surfaces after preparing raw turkey for roasting. -Wash your hands after getting the turkey ready.